The kids and I came to Huntington on Friday to spend some time with Nena, Poppy and Pappaw. Chad flew in on Monday after traveling to Florida for a friend's ordination. Thankfully we arrived just before the snow. We woke up Saturday morning to about 6 inches of snow. 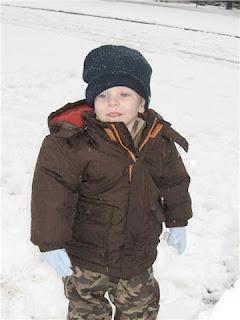 We did not have any snow boots as we are not used to getting so much snow. 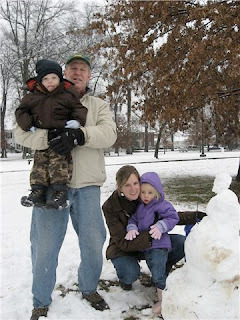 We all piled in the car and went to get some snow boots before going to Ritter Park. 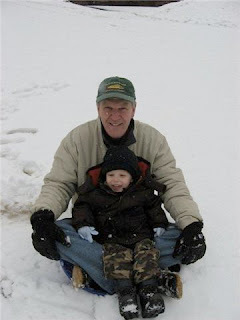 Apparently, sledding in Ritter Park is a Huntington tradition when it snows. Nena had a saucer that we used to slide down the hill. Caroline did it once and that was enough for her! Tucker went down the hill over and over! Nena, Poppy and I all took turns riding with him. He loved it! 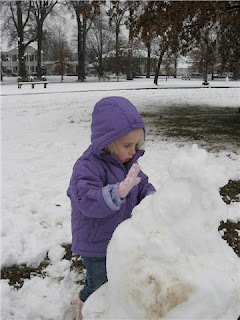 Caroline opted to build a snowman with a little help from Nena. It was lots of fun and definitely got us in the Christmas spirit!